I’d be surprised if anyone sees this given it’s nearly a year since my last post and even I thought Velvet Jacket was all done and dusted. But the BBC have only gone and pulled some lost Daleks from out of a mercury swamp and given us a new DVD of the animated The Power of the Daleks. So it seemed only fair I do my bit and produce an alternative cover for it — gotta keep that shelf looking consistent! As ever, you can download the cover from Velvet Jacket and read some notes about its creation here. Hope you like it (if anyone’s there). I’ve made some small tweaks to a handful of past covers, mainly just updating elements with better-quality picture sources where past limitations had bugged me, but also so that as the site passes into more of an archive phase any new users have access to the best-quality covers. I was initially going through the covers to see which ones still had the old Black Pyramid web address on the back so that I could change them to Velvet Jacket, when I spotted a few elements that I’d long been unhappy with or knew that I had since found better source images of. They didn’t warrant completely new designs, as I’d done with Pyramids of Mars, although I have rebuilt some from scratch. An Unearthly Child (and its title variants) mainly required the Tardis redoing, since I now had a high-res copy of the image (actually from Marco Polo). I also adjusted the colours on the Doctor and Susan (changing her dress colour to balance the browns on the right of the cover) and re-did the swoosh from the opening titles with better contrast. For The Daleks (etc) I just planned to replaced the Doctor with a better-quality version of the same image but in the event decided I wasn’t keen on his pose. I found a good shot of him unobscured by the equipment he gives to the Thals at the end of the story, but his face was rather blurry, so I replaced his head with a clearer shot. I also took the opportunity to use a sharper photo of the Dalek city, even though on the final cover it’s hidden behind the title. The Edge of Destruction took more work as I wanted to redo both the Doctor and the console with higher-res images (the latter colourised from scratch). I thought I might need to recreate the Tardis wall and doors too, but was happy to find my original was better done than I’d remembered and was just improved with some more dramatic lighting. Although mostly hidden, I did also replace the ceiling light with a better quality image. For The Dalek Invasion of Earth I thought the Doctor needed updating but found the quality better than I had remembered, certainly after a bit of tweaking of levels and colour balance. I also re-levelled the sky as the blacks weren’t true, and replaced the flames with better sources. While the blue burst behind the Dalek is the same as before, I did tinker with its layer mask. The Leisure Hive was just a case of updating the Doctor with a higher-resolution version and he now matches the quality of the other elements much better (a long wished-for improvement). Finally, The Two Doctors I started from scratch, although keeping the essential design the same. One thing I wasn’t happy with on the original cover was the way the title had to be squeezed in, so I reshaped the two background panels to allow the lettering to be larger (and to make them more interesting shapes than straight rectangles). Chessene and Stike (actually, I think it’s Varl) were taken from the previous cover with minor tweaks, as was the space station wall behind the Sontaran. As I was unable to take screengrabs when I first designed the cover, I had used some holiday snaps of a Seville street behind Chessene, so took this opportunity to replace that with a more appropriate view of the hacienda. I had a much better quality photo of the Sixth Doctor (not quite the same as previously but from the same shoot) but because he was standing with Peri, some of whom I was able to paint out, I had to place him a bit further to the left than I’d have liked. I had intended to just update the Second Doctor with a higher-res photo but decided I didn’t like the way he was looking over his shoulder to the right, so replaced his head with a nice close-up of a classic Troughton expression. I also allowed him to overlap the title, which I had avoided previously but now felt his stature justified. For those who have already printed my covers for these stories, it’s entirely up to you whether you feel these changes warrant a reprint. Personally, I have (although I hesitated a little over whether to bother with The Leisure Hive) but I felt they were worth doing for any future users who stumble across the website. Less significantly, I’ve also been through the 60s stories and tweaked some of my colourisations of the Doctor as I feel my skills have improved since originally attempting them. Those I’ve altered and uploaded new ZIP files for are: The Keys of Marinus, The Rescue, The Romans, The Space Museum, The Chase, The Web Planet, The Ark, The War Machines, The Dominators and The Mind Robber. There is one last cover I want to amend. The photo of the Doctor on Earthshock is rather poor and I’d like to improve it but for now I can’t find a better copy than the one I used originally. So if and when one turns up, I’ll revisit that cover. Until then, Velvet Jacket is finally complete and I hope you enjoy my work. 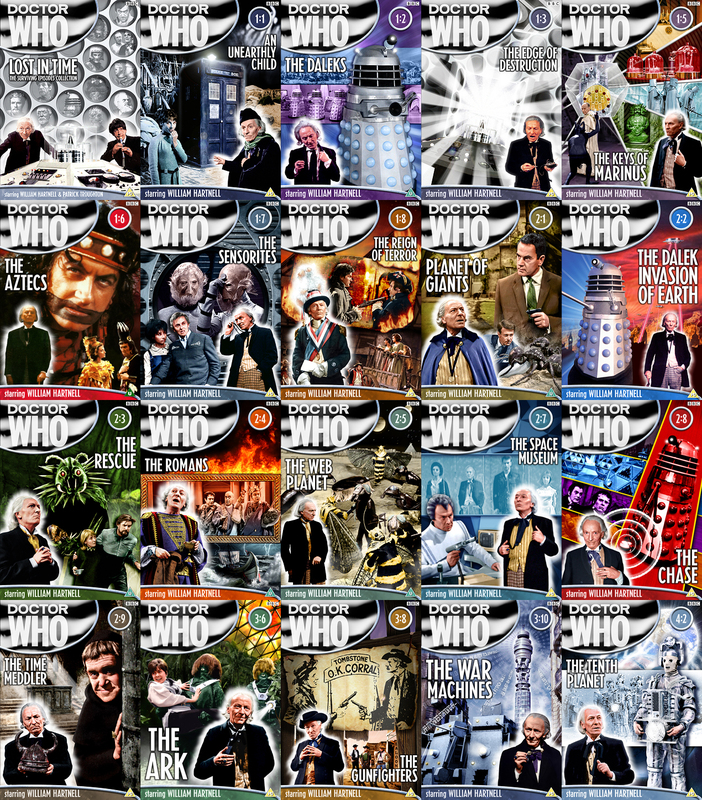 As mentioned below, now I have completed covers for all the released Classic Who DVDs, I’m tidying up some of my earlier efforts that haven’t had re-releases (thus providing an excuse for me to revisit them). Without wishing to go crazy or whitewash the past (or make anyone feel compelled to print them out again), these are mostly minor tweaks, replacing some low-quality images (mainly of the Doctor) with higher-resolution versions, but without changing the overall design. One exception, however, is Pyramids of Mars, my original cover for which I was never really happy with. So I have produced a completely new one which I think represents the story much better. It’s available now and you can read about why I was unsatisfied with the previous version and how I approached the redesign here. Available now at Velvet Jacket are the final four covers for re-released stories: The Aztecs, The Claws of Axos, The Green Death and The Ark in Space. These are mostly just upgrades of the originals with better picture sources (plus, I like to think, greater skill on my part) and updated Special Features details on the back, but you might notice at least one is a complete redesign, and the others have been tinkered with to greater or lesser degrees. You can read about their creation here. These four covers finally bring Velvet Jacket’s primary goal to completion: alternative covers for all the DVD releases of broadcast Classic Doctor Who — and it’s only taken me 14 years! There have been gluts and gaps along the way but I’ve greatly enjoyed producing the covers. As stated at the outset, these were made for my own pleasure and use but positive feedback from friends and a burgeoning demand for alternative covers when the range first began led me to make them available online. As the official covers improved over the years, interest in alternatives died away somewhat but, having started, I was always determined to finish my range. I’d like to thank all those who have stuck with me. I know back in the early days of the Who DVDs, replacing the covers seemed a risky venture as you could never be certain the artist would give up half way and leave you with either uncovered stories or wasted print-outs. So I’m glad that anyone who has been using my covers for their discs can now be assured of a consistent bookshelf. On that point, the diligent among you will realise there was more to the Who DVD range than just the standard stories and a few supplementary releases were included. K-9 and Company has been covered (if you can find him on the site) but there was also the unfinished Season 17 finale Shada, the 1994 extended documentary More Than 30 Years in the TARDIS, and the 2005 online animation pilot Scream of the Shalka. As these aren’t part of the standard range — and more practically, images from them are limited — I don’t plan to do covers for these three (at least for the moment). What I have done, therefore, is produce VJ-style spines for them which you can slip into the cases so that your bookshelf at least looks consistent. So does that mean Velvet Jacket is all done and dusted? Well, perhaps not quite. Like any creative, I could tinker and tweak my work for ever and still never be 100% satisfied, but now the range is complete and people can confidently choose to re-cover all their DVDs, I don’t want to keep revising covers they may already have printed out (which I appreciate is not cheap). However, I have identified five releases from the early days that haven’t since been reissued (all on page two of the cover gallery) which have elements I’d like to redo if I can now find better quality photos — and one I was never happy with so may redesign completely. So there may yet be a handful of further updates. For now, thanks again to everyone who made it this far — I hope you feel the project has been worth it. 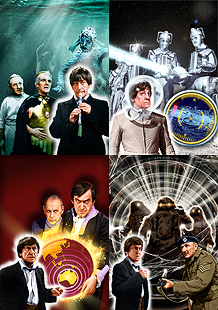 To mark the release of the final Classic Doctor Who DVD, the four outstanding Second Doctor covers are now available to download from Velvet Jacket: The Underwater Menace, The Moonbase, The Enemy of the World and The Web of Fear. Yes, it’s taken me a while but I thought the end of the DVD range was a good moment to get the last handful of covers done and posted. There are still a few revisited titles that I need to update the covers for, a couple of which need completely redesigning, so now I’m on a bit of a roll I hope to get these completed shortly. My latest book is now available in print at Amazon. In 1981, the publication of Jean-Marc Lofficier’s original Doctor Who Programme Guide was a seminal moment in the history of Doctor Who reference books (and in many young fans’ enthralment by the series). This and the updated edition in 1989 — which covered up to what turned out to be the end of the Classic era — became the series bible for fans throughout the 1980s and 1990s. Now the legacy of that original guide continues. Picking up where the 1989 edition left off, The New Who Programme Guide covers the revived series from the debut of the Eighth Doctor to the passing of the Eleventh. Every television adventure, plus the many mini-episodes and prequels produced for broadcast and DVD, is detailed in the same clear and concise format. Each has a full cast list featuring both credited and notable non-speaking roles; the names of the writer, director and producers; and a brand new synopsis of the storyline. There is also a rundown of in-character appearances by the regular cast outside the main programme, and indexes of every actor, writer, director and producer to have worked on the show. Presented in the same compact and easy-to-use form as the original Doctor Who Programme Guide, the book is the perfect companion to Lofficier’s original and a handy quick-reference guide to the New Series. 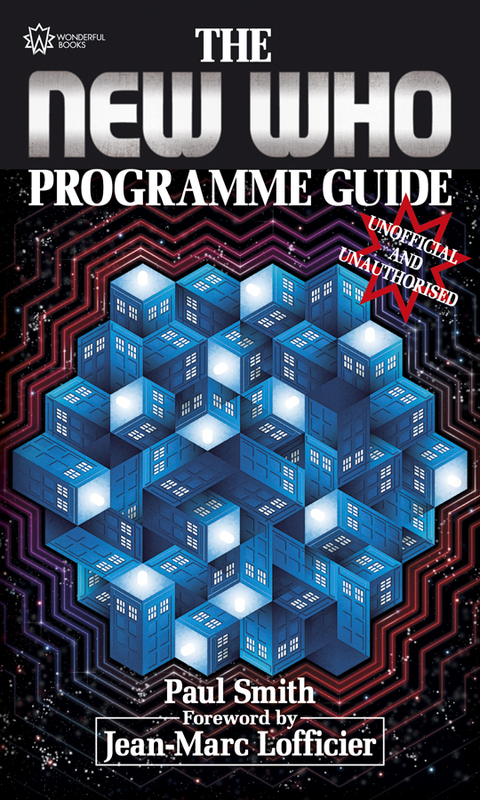 The New Who Programme Guide is available now for £7.99 from Amazon.co.uk or $11.99 from Amazon.com. The countdown to 50 is nearing its end with the last of the First Doctor releases: The Reign of Terror and The Tenth Planet. Click here to download the cover from Velvet Jacket, and read notes about its creation here. The William Hartnell era is now complete, more or less. I was hoping to have the updated The Aztecs cover ready as well but I’m still working on it (lots of feathery costumes to cut out) and didn’t want to rush it unnecessarily. It should be available shortly. Other than that, I may take another look at The Dalek Invasion of Earth some time as it’s the only early release that hasn’t been revisited and I’d like to improve the photo of the Doctor at the very least. Thanks to everyone who has commented on the covers over the years, and to those who actually choose to use them — I’m truly flattered. So with just a few loose ends and a handful of upcoming releases to go (rumours notwithstanding), stage one of the site is nearly completed. The question then will be whether to produce DVD-style covers for the missing stories. Are these something you would use? Does anyone keep their soundtrack CDs in DVD cases in order to have a uniform Who collection?